An idea packed inspiration post showing you how to make a glamorous and chic bar cart for your home and wedding. I have to say that a bar trolley is top of my list of ‘things to make to make our new place look pretty’!!! Seriously, I fell in love with the bar trolley the gorgeous girlies at A Beautiful Mess restored & ever since have vowed to have my own! As we only moved in just before the moon, I have yet to complete this task BUT I am very much looking forward to getting stuck into the project. PLUS I have a ton of my pretty disco ball cocktail stirrers (all hand made of course!) that I cannot just hide away!!! Although I am now wishing I was back in sunny Morocco sipping some of the gorgeous cocktails we sampled over there!! Ps. favourite tipple is ALWAYS a glass of good old bubbly! But cocktail wise, I have recently discovered a liking to a good Whisky Sour, So Fresh Martini, Gin Fizz, Apple Martini (the wedding drink!) and every girl’s fav a good Cosmo! Totally agree with Rebecca and Sophie – this is a fab post Lolly! We registered for a gorge tray from Brissi on our JL gift list; much to my husband’s cries of “why do we need a tray with a bird on it”… well, for precisely this reason! 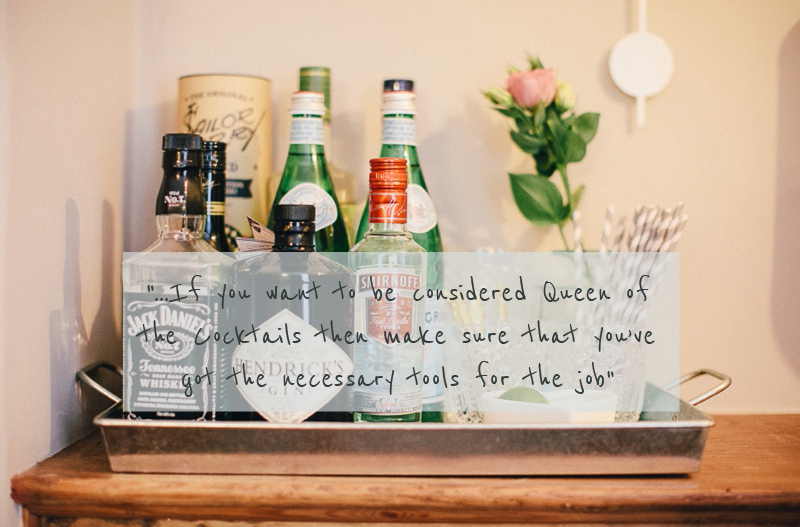 I can’t wait to stock up my bar tray with lots of goodies but need to start compiling the alcohol, cocktail stirrers and all the lovely little bits – I love those initialled coasters! For some reason, am partial to Martini Bianco at the moment so that will definitely feature!! I didn’t realise I needed a bar tray, let alone that it had to be an expression of my life journey so far. I keep my drinks in a cupboard. Clearly according to this post that means something bad for my deep inner personality. Wow, I overlooked this at our wedding, great photos.